“The prior art fixed barrel guns have the disadvantage that prior to firing it is required to effect a manual adjustment of the gun which is necessary for prearranging it to stand the pressure which will be generated by the cartridge during explosion in order not to damage the breech frame during recoil and to facilitate the ejection of the cartridge case. In reality, the objects of the over fifty year old design have been only partially fulfilled. Many Civolani-actioned guns have a problem with light loads, particularly the 3-1/2 inch chambered guns, and the less than effortless loading has long been referred to as the “Benelli Thumb” and the propensity of the action to not go into battery is known as the “Benelli Click.” Along the way, many models have been made that are more plastic-filled and polymer-adorned every year. At 6 lbs. 11 oz., the Masai Mara sheds over a quarter of a pound (up to half a pound) compared to many 12 gauge 3 inch inertia guns that I've tested. The Franchi Affinity 12 gauge (plastic) weighs 7 lbs., the 3 inch chambered Benelli Vinci 7.1 lbs., the Weatherby Element Max-5 camo is 7-1/4 lbs., the disappointing Breda Damasco ($2995 MSRP) is right at 7 lbs., the Girsan MC312 walnut is 7 lbs. (camo is 7 lbs. 2 oz. ), and so it goes. At the same time, the Masai Mara does have better build quality than many examples. For example, the trigger guard and magazine cap are both aluminum alloy, not cheap blow-molded plastic. It has a better grade of walnut (and it isn't a fake or artificially enhanced pseudo-walnut) than most shotguns that can be quite a bit pricier as well. At the same time, it is an increasingly crowded field in inertia-land. Retay Arms is using a couple of model designations that are copy-cat genre designations: the “Super Black” and “Super Sport” are far too close to the well-established Benelli “Super Black Eagle” and “Super Sport” models in name to give Retay any fresh brand identity. My test model lacks the Masai Mara “wildebeest” logos on both sides of the receiver, and sling studs are installed . . . not what I'm looking for in an upland model, but more appropriate in duck gun trim. My understanding is that the imported models will have slings included, but not installed on the walnut models. The most logical comparison of the Masai Mara in the United States is to the Weatherby Element series, made by ATA in Turkey. In order for the Masai Mara to make a splash in the United States, it will have to be priced at essentially the same level as the Weatherby models: Weatherby having a large edge in brand familiarity to American shooters. As of this writing, the Weatherby Element Deluxe 12 gauge walnut is widely available for about $800 in polished blue. The Weatherby Element Waterfowler (camo, plastic stock) can be had for about $640. If Retay Arms can compete directly with the Weatherby, I feel they will do quite well. In that case, the hard case rather than a cardboard box, five choke tubes as opposed to three, the quick release trigger, and alloy trigger guard and alloy forearm cap begin to show obviously greater value. The Masai Mara also has a flat buttstock end, making it easy to change recoil pads (if you prefer) as compared to the concave end of the Element. Although I've carped about the smallish safety of the Masai Mara, the Weatherby safety is smaller yet: a truly dinky triangular little affair. 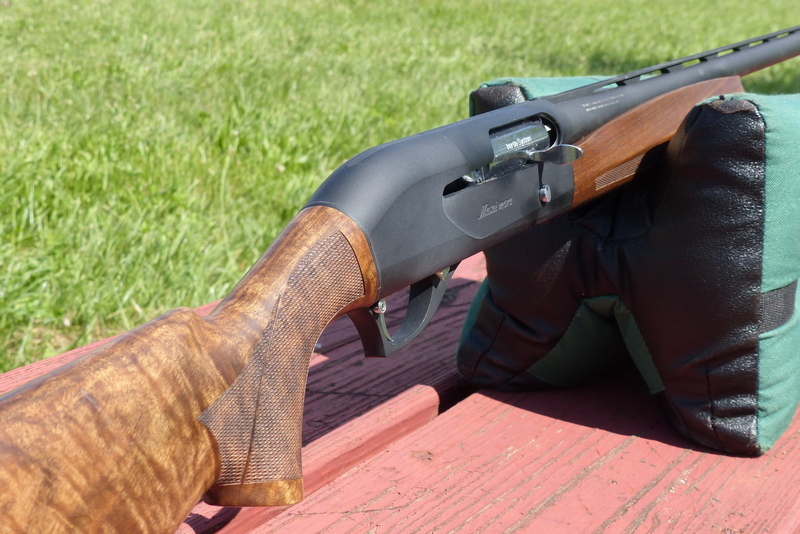 Value-minded consumers will have no problem at all coming up with $800 for a smoother loading, lighter, beautifully walnut stocked Masai Mara vs. a $1400 plastic-stocked Benelli M2. It appears that Retay is indeed going to be competitive, as of July, 2017, the MSRP on this tested model (the Masai Mara Super Black) is $949, with the individual dealer setting their own prices. The Retay Masai Mara was tested with the standard array of loads I use for most all 3 inch chambered 12 gauge inertia guns, starting with economical 1180 fps 1 oz. Federal Top Gun ammo, and moving up from there. Prior to firing, the gun was given a couple of drops of BreakFree ClP along the bolt track, but there was no break-in whatsoever. As mentioned prior, I feel the safety could be more generously sized, and another niggle is that the front red “fiber-optic” bead is too big: I'd prefer a smaller brass bead. The walnut forearm is held securely by the forearm nut / spring array flush against the receiver. Though this is a minor point, although the forearm does not rattle, you can inadvertently twist it a bit as there is no in-letting to prohibit a small amount of rotation. I'd prefer a more completely solid lock-up between the receiver and the forearm that allowed no movement at all. Finally, the supplied “multi-language” owners manual is poorly formatted and extremely clumsy to try to read. An English-only manual would be far more useful, even if it was offered as a PDF download. I do like the detachable trigger array, while admittedly popping off a complete trigger guard is not a big deal, requiring only knocking out one or two pins with a punch to quickly accomplish. I do like the alloy trigger guard and alloy magazine cap. Cheap plastic trigger guards with unsightly, visible mold lines get old in a hurry. I also like the 8mm wide rib: a bit wider than some of the common 6mm hunting ribs. Retay Arms is generous with the hard case, included shims, and five choke tubes. It is a nice step up from the common cardboard box and three choke tube routine. The easy, smooth loading and long charging handle are both welcome, and the Turkish walnut stock set is truly gorgeous. The Masai Mara is an excellent weight for a field gun; it is neutrally balanced and shoulders quickly and effortlessly. It is a comfortable gun to shoot with 1 oz. 1200 fps loads for the dove field and for a bit of casual clays. For more of a dedicated clays gun, it is a bit on the light side for most tastes, including mine. As a low-maintenance upland hunting gun, this Masai Mara goes up against the Weatherby Element as mentioned and also the Franchi Affinity series, now offered as the “Affinity 3,” in the same general pricing area. Versus the Franchi, the Masai Mara wins easily, due to the extremely well-done high grade walnut, the more generous recoil pad that can be easily changed according to personal preference, where the strange, angular Franchi TSA pad cannot. The Masai Mara has less plastic, better finish, and is a higher level of shotgun compared to the utilitarian, plain-looking Franchi. The Masai Mara action is the same action throughout the line. The real head-turner, if it looks as good in person as it does in the pictures, is the "Masai Mara Comfort" model. shown above. It sounds like this high grade polished blue model will be available for just under a thousand dollars. Versus the Weatherby Element Deluxe, again the Masai Mara has a more conventional recoil pad compared to the concave cut-out affair of the Weatherby, and the less than generous Masai Mara safety is still large compared to the minuscule triangular attempt of the Weatherby. At a quarter pound lighter than the Benelli M2 12 gauge and the Franchi Affinity 12 gauge, the Masai Mara is more pleasant to carry, a bit better balanced, and faster to shoulder. Compared to the Weatherby Element in plastic-stock / camo trim, the Masai Mara shaves off a full half pound, making it a better upland gun for pheasant, quail, grouse, and any type of hunting where significant walking is involved. The only thing I need to do to the Masai Mara to get it ready for the field is install a far smaller bead. Other than that, it is completely hunt ready right now. I've not seen or handled a “Masai Mara Adventure” or any other of the plastic stocked models, but based on the Retay Arms description they are a bit lighter yet than the walnut models. Well-figured walnut is hard to find at an economical price, though, and it is the quality of the wood that helps the Masai Mara stand out. Based on the overall build quality, the exceptional walnut, along with the extra goodies like the hard case, five choke tubes, included shims, five year warranty, and so forth, the Masai Mara “Super Black” is a winner in my book: it is a great-looking, very low maintenance, easy to carry, reliable hunting gun at a beguiling price level. If you e-mail Chris, he can give you model specifics, exact pricing, and up-to-the minute delivery information as well. My understanding is that the Retay USA website is currently under construction, and that will make the complete Retay USA line-up far easier to refer to.